The British Antarctic Survey announced it has decided not to winter at Halley VI Research Station for safety reasons. 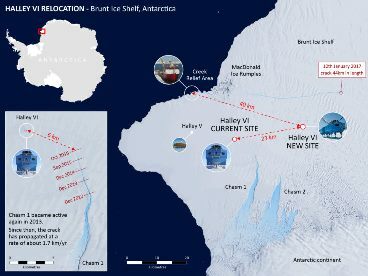 The station is located on the floating Brunt Ice Shelf in Antarctica; it will shut down between March and November 2017 because changes in the ice, mainly the growth of a large new crack, present "a complex glaciological picture that means that BAS scientists are unable to predict with certainty what will happen to the ice shelf during the forthcoming Antarctic winter," according to a Jan. 16 society announcement that said for precautionary reasons BAS will remove its people before the Antarctic winter begins. The station is in the final stages of being moved about 15 miles present site to a location upstream of a previously dormant crack that began to grow in 2012. The new crack appeared in October 2016 about 10 miles north of the research station. "Since then glaciologists have monitored the growth of this crack using a network of GPS instruments that measure the deformation of the ice, together with European Space Agency satellite imagery, ground penetrating radar, and on-site drone footage, which show that the recent changes to the Brunt Ice Shelf have not been seen before," according to BAS. "They have run computer models and created bathymetric maps to determine whether or not a large iceberg will calve, and the impact that could have on the remaining ice shelf. They conclude that they are unable to predict with certainty what will happen to the ice shelf during the forthcoming Antarctic winter and beyond. There is no immediate risk to the people currently at the station, or to the station itself. However, there is sufficient uncertainty about what could happen to the ice during the coming Antarctic winter for BAS to change its operational plans." The society expressed confidence that it can rescue personnel during summer months if a fracturing of the ice shelf occurred, but it describes access by ship or aircraft as "extremely difficult during the winter months of 24-hour darkness, extremely low temperatures, and the frozen sea." Currently there are 88 people at the station, including 16 who were scheduled to remain there during the winter. Options to redeploy research and technical support teams temporarily to other parts of the society are being explored, it reported. Researchers at the station conduct earth, atmospheric, and space weather observations. "Halley VI Research Station sits on a floating ice shelf. It was designed specifically to move inland if required," said Director of Operations Capt. Tim Stockings. "The current work to relocate our station is going very well. This challenging engineering project is scheduled to complete as planned by early March 2017. We want to do the right thing for our people. Bringing them home for winter is a prudent precaution, given the changes that our glaciologists have seen in the ice shelf in recent months. Our goal is to winterize the station and leave it ready for re-occupation as soon as possible after the Antarctic winter." Meanwhile, NASA reported Jan. 18 that Earth's 2016 surface temperatures were the warmest since modern recordkeeping began in 1880, citing independent analyses it had done and also those by the National Oceanic and Atmospheric Administration (NOAA). Globally-averaged temperatures in 2016 were 1.78 degrees Fahrenheit (0.99 degrees Celsius) warmer than the mid-20th century mean, which made 2016 the third year in a row to set a new record for global average surface temperatures.